...though perhaps not when the gales make the windows flex! 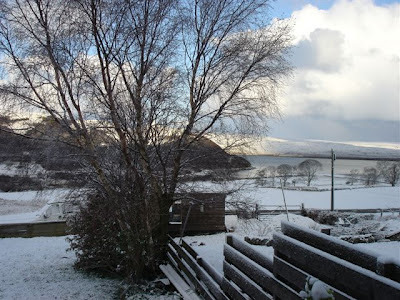 It's more than a year now since I first discovered Sian’s blog and began to read about her life on the Orkney island of Graemsay. I was immediately entranced by the setting and her lovely photographs and descriptions of life in this beautiful, remote and windswept place. 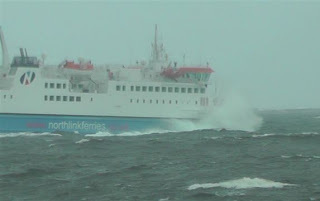 It certainly never occurred to me, even in my wildest dreams, that I would one day visit her on her tiny island, with its 27 inhabitants, set in the treacherous waters between the much bigger islands of Mainland and Hoy. 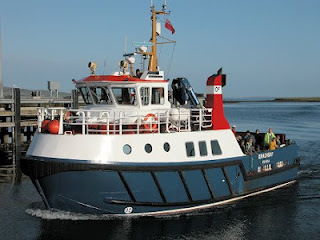 Yet that is just what happened last week as my birthday treat, when on Thursday DH deposited me at the harbour in Scrabster and stayed safely on shore to film my departure on the MV Hamnavoe for my rather lively crossing to the picturesque little port of Stromness. The main street of Stromness! On arrival at the ferry terminal I was met by Sian and, just as I had come to expect after my meeting with The Broad, the talking began and hardly stopped for the next 24 hours. J Yet again we leapt straight over the usual preliminaries and had the most wonderfully enjoyable conversations, as Sian showed me the area she had chosen to move to over 10 years ago. After a welcome cup of tea we caught the much smaller ferry across to Graemsay, and it being 4pm, found ourselves on the school bus crossing, surrounded by the handful of youngsters who call this tiny island home. Fifteen minutes later we were helped ashore from the tossing ferry and Sian drove me the short distance to her house, wonderfully situated on the shore near the Hoy High lighthouse. Later, as Sian was making our evening meal, I took my camera and went outside to wander round her domain, with its walled garden and glorious views out to sea and across to the hills of Hoy and the huddled buildings of Stromness. After supper we went out to explore the island, which is about 2 miles long by 1.5 miles wide, with 12 inhabited houses and not much more than 2 miles of properly surfaced road. After driving across to the Hoy-facing shore to see the old church, now a farmer’s barn, and then past the former school and school-house, Sian took me to meet another blogger - yes, two bloggers on the same small island! Irene was the very last head-teacher of the tiny school on Graemsay. When she took up the post in the early 1980s, the school had 3 pupils. Over the years the number fluctuated, but when it eventually fell to just one, the school was closed in 1996 and Irene and her husband stayed on in retirement on the island they had come to love. …..blue skies, that is. J Just to prove that sometimes – OK, very occasionally – the weather in the far north of Scotland can be so much better than the weather further south, here are a couple of photos taken on my way back from church this morning. Apologies to all those awash with excess rain in a time of drought, but sometimes even the best of us can’t help gloating a little. The Orkney islands, that is…. Tomorrow will be my birthday treat, when DH will drop me at the ferry at Scrabster and head off in our little campervan to do his own thing for the next day and a half. 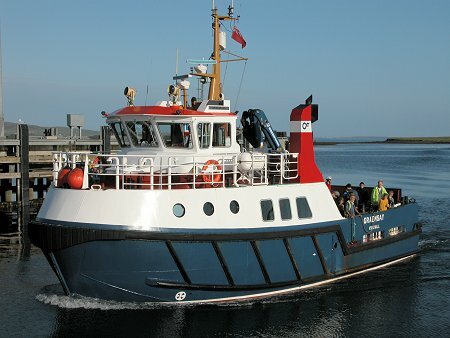 Meanwhile I will let myself be carried across the probably choppy waters of the Pentland Firth to my long-awaited and eagerly-anticipated visit to Sian on her small island of Graemsay. 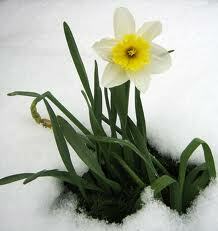 As usual in this most disappointing of Aprils, the weather forecast isn’t wonderful, but we won’t let that deter us. One can talk and talk in the worst of weather and take advantage of any lulls to get out and walk on the lovely shoreline I’ve seen so often in Sian’s photos. Every year when this week in April comes around, I find myself beset with memories of my parents. Thirty-four years ago today my father died at the age of 70, a fair age, but by no means very old by modern standards. 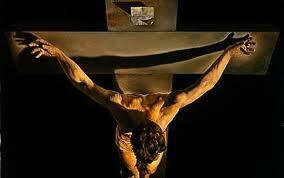 He died on the eve of my mother’s 62nd birthday, and sadly she survived him by less than five years. In their thirty-seven years of marriage my parents worked very hard bringing up their five daughters, but still managed to find some time for their own interests and hobbies. One interest they shared was their love for the extraordinary voice of another Lancashire woman, who might have celebrated her 100th birthday this weekend, had her life and immensely successful career not been cut tragically short at the early age of 41. 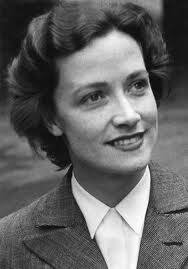 Kathleen Ferrier was born on April 22nd 1912 and grew up in the neighbouring town of Blackburn, only a very few miles from where my sisters and I were born and grew up. Throughout my childhood I was aware of her as ‘our’ celebrity – the local girl whose name and voice were now known throughout the world. Every school class in the area had its quota of Kathleens and her premature death only added to the sense of local pride in her achievements. For Kathleen Ferrier had been blessed with a truly wonderful contralto voice – rich, deep, resonant without a hint of harshness, and extraordinarily expressive and moving. It shone above all in the repertoire of 18th century opera and oratorio which she made her own, but also in her much-loved recordings of British folk-songs. Unlike my younger sisters, I’m no expert on the subject of music or singing, but I have always known that Kathleen Ferrier possessed a unique talent, which, almost sixty years after her death, continues to enrich the lives of so many people, including me. I find it sad to think of the recordings she never lived to make, but we must be grateful for the superb legacy she did bequeath to us. I will leave you with two clips, which show to perfection the breadth of her skill and the glory of her voice. 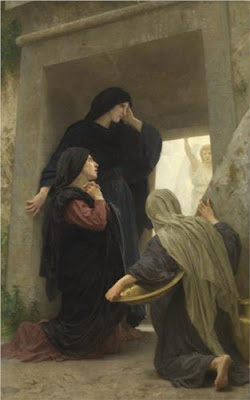 Like a number of bloggers I follow, I’m finding that after the intensity of Holy Week and Easter, my mind seems to have gone on to standby as far as inspiration is concerned. Or perhaps it’s just that all my available mental energy is being absorbed by my new acquisition. Yes, dear readers, all the detailed and careful research I mentioned in passing in my last post came to fruition last Saturday with the delivery of this year's birthday present and my brand-new pride and joy – my very first laptop! I feel I should apologise for teasing you all with such secrecy about a basically mundane purchase. Yet to me it feels very far from mundane. Since the moment I first clicked tentatively on a computer mouse nearly 20 years ago now, all my computing has been done on a series of desktop machines, mostly DH’s cast-offs. Not for me the app-laden smartphone or glossy tablet: instead I’ve been nursing the same ageing desktop since before I retired 5 years ago and it’s still going strong, albeit rather more slowly, like its owner. I blame my addiction to blogging for making me realise I needed a means of mobile computing, and for me a laptop was the only sensible solution. Now that DH has finished setting up my new baby, I’m spending every spare moment getting to grips with Windows 7 and all the other innovations which have passed me by for so long. It’s a steep learning curve and my brain is beginning to hurt a bit, but I’m gradually getting there and am enjoying the process enormously. It doesn’t take much to make me happy……. So while I relax and recover, I will leave you with a glimpse of the glory that is Ben Loyal in the snow, taken last week from the conservatory at the back of the house. No wonder it is known as the Queen of Scottish mountains. In the other direction we look out over the Kyle of Tongue, with its ever-changing patterns of water and sand. The landscape of the North-West Highlands never fails to awe us with its beauty and its variety. This aria sums up all I would want to say today. That morning, at an unusually early hour for one of our departures, DH and I had crammed the last items into the campervan and set off north in blazing sunshine. In fact we set off so early that we arrived well ahead of our appointed time and had time to say hello to the family members who were gathering at my brother-in-law’s house for the following day’s celebration of my mother-in-law’s birthday. Ten minutes before we were due, we set off to drive the mile or so to The Broad’s house, only to find that the last little bit of the route had been pedestrianised without anyone having told our satnav. Poor Gladys got very upset at our refusal to go down the road she was indicating and went into a sulk, so that we had to force her to work out how best to circumvent the obstacle and arrive at our destination. The next obstacle manifested itself when we arrived in the right street, only to find that neither of us had remembered to write down the house and phone numbers so carefully provided by The Broad. Doh! Thankfully, before we left home, we had found her address on Google Street View and DH’s visual memory rose to the challenge of identifying the right house without the number. Only ten minutes late despite everything, we finally walked up to the front door to be greeted by The Broad with a huge grin and a hug, as though we were simply seeing each other again after a gap, rather than meeting for the very first time. There were absolutely none of those awkward preliminaries, as people send out conversational feelers to start to get to know each other. 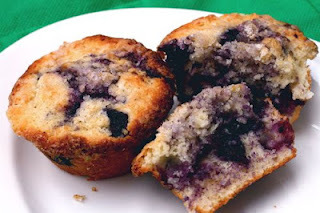 Indeed, within minutes we were sitting round the kitchen table with big mugs of tea and delicious homemade blueberry muffins, nattering away nineteen to the dozen. The Broad and her husband are so interested and interesting, so easy and amusing to talk to, that it was as though we were the oldest of friends, catching up with each other’s news and activities since we had last met. Our conversation ranged widely and randomly, like all the best meetings of friends, yet we parted knowing there were so many subjects we hadn’t even touched on, but which we could save for next time. For there will be a next time, hopefully lots of next times, as a virtual friendship is transformed by a single meeting into an actual friendship. Before DH and I left, we all went into The Broad’s beautifully reappointed office, where our respective husbands tried their best to take some photos of two laughing women, (one of whom has a very bad habit of closing her eyes when being photographed) which weren't blurred or unrecognisable and which captured something of the spirit of our meeting. I think they succeeded. Broad, meeting you and The Man was great and I’m so glad you suggested it. Here’s to friendship. Why can't this woman keep her eyes open? Now calm down and stop giggling, you two! …and now it’s snowing! After a marvellous week or more of almost summer-like weather, Easter is rapidly approaching and the British weather is taking a predictable nosedive. The journey up to the northern coast of Scotland was as wonderful as ever and the sun even shone for us almost all the way. We had a great couple of days in Southport with family and visiting The Broad (of which more anon) and now we are busy making sure everything has survived the winter weather unscathed. As soon as I've finished unpacking and sorting everything out, I’ll be back to tell you more.